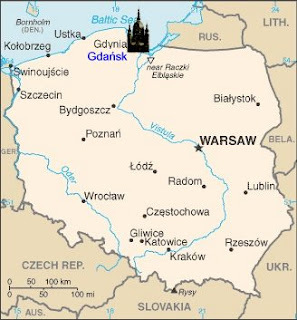 Maybe Mr Reidski is right about underhand Western(US) links with the Polish freedom movement. I don't know. I don't think anyone really knows but I would like to believe in the legend of "Solidarnosc" - how Lech Walesa scaled the Gdansk shipyard walls in mid-August 1980 and ignited the blue touchpaper that would lead to the implosion of tired old state communism throughout the nations of the Warsaw Pact - symbolised ten years later by the tearing down of the Berlin Wall. 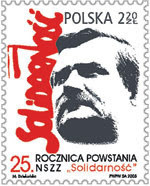 Walesa just happened to be in the right place at the right time and his fellow shipyard workers needed a mouthpiece, a man who could voice their accumulated grievances and their hopes for the future. On Tuesday morning I was at the Solidarity Building near the railway station in Gdansk, specially to see the "Roads to Freedom" exhibition which documents and celebrates the rise of the Solidarnosc movement. I half expected the place to be mobbed when it opened at ten but I spent an hour looking round and by eleven nobody else had even entered the building. The two members of staff present had puzzled expressions on their faces when I bought my two souvenir T-shirts. I felt a little sorry for disturbing their underground peace. The old lady returned to her knitting. In nearby Solidarity Square, I saw the monument to the fallen shipyard workers of 1970 - a bitter memory which added fuel to the famous events of 1980. 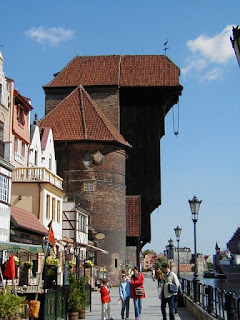 The main street in the old town of Gdansk is I believe sometimes referred to as "The Long Market" and I swear it may be the most beautiful city street I have ever walked upon - shiny old paving stones and brick turrets, tall thin houses reminiscent of Amsterdam as it bends gently up from the river. Here you see civic pride and the trading wealth of six centuries - made all the more remarkable when you consider that the city was smashed to bits in World War II. I rode on a riverboat out towards the Baltic Sea, to Westerplatte where the first shots of World War II were fired late in 1939. You gain a sense of the importance of this small maritime city - of its vital trading, political and territorial positions. I climbed the tower of the world's tallest brick built church and scanned the bright horizons all around. It still seems a proud place, one eye on the past but looking positively ahead to the future. It made me wonder why so many Poles are leaving their land when it needs them. Why aren't they staying to mend the teeth, teach the children, build the houses, revitalise their industry? Greed? Poland needs them and yet here in the UK we keep our doors open to all and sundry... but if you dare to broach this topic you'll probably be shot down in flames by the stormtroopers of the P.C.G.M. (Political Correctness Gone Mad). When I tried to snap a shot of The Grand Hotel in Soppot where Hitler resided briefly in 1940, my digital camera died. 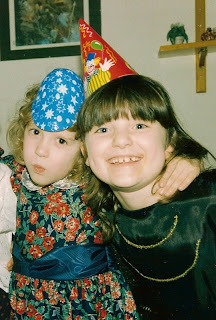 This would never have happened with the Kodak Brownie I received on my eleventh birthday. So the pics are not original - just culled from Google.... By the way - totally unrelated - Wigan 0 - Hull City 1!!!! NAH! NAH! NAH! 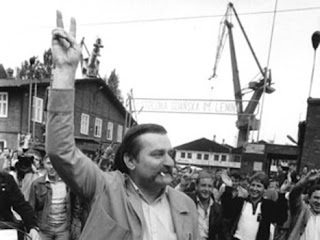 Lech Walesa outside the famous shipyards... twenty seven years ago. Blogger Mr Arctic Fox from noxious Huddersfield recently challenged other bloggers to relate facts about themselves, foreshadowing his own list of facts about the rare arctic creature after which his blog was named. I hereby lift up the gauntlet with several facts about the Yorkshire Pudding. 1. 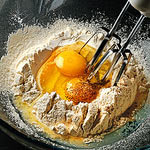 The first known Yorkshire pudding recipe to be printed appeared in "The Art of Cooking" by Hannah Glasse in 1796. 2. The Yorkshire pudding was often served as a first course "filler" for poorer people to reduce their appetite for second course meat. 3. Left over Yorkshire pudding can be eaten as dessert with fruit jam (jelly to American readers). 4. The cricket umpire Dickie Bird once wore an upturned Yorkshire pudding on his head like a flat cap for three overs of a test match and nobody noticed. 5. 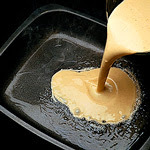 A stale Yorkshire pudding can be soaked in water and used as filler for cracked walls where it hardens like plaster. 6. The frisbee was first invented by two American college students who were throwing a large discarded Yorkshire pudding around in their college grounds. 7. 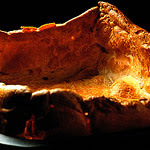 When placed in a Lancashire oven, a Yorkshire pudding will never rise. 8. Elvis Presley passed away after choking on a piece of Yorkshire pudding that had gone down the wrong way. 9. The Yorkshire pudding is an ancient aphrodisiac. 10. The owl and the pussycat didn't sail away in a pea green boat - it was a watertight Yorkshire pudding which they nibbled during their treacherous voyage. This is not one of those "meme" thingumybobs that gets passed around Blogworld but if you too fancy providing some interesting facts of your own then please go ahead...! The youngest member of the female quartet I mentioned in my last post was our daughter Frances. Two days after the quiz, it was ten o' clock in the morning and I was yelling at her to get up. I mean after all, it was A level results day and most of her friends would have been at school before dawn to discover what they had got. A day like that day is a day that can literally change the whole course of your life. "No! I'm not leaving this room!" she was yelling back. "I'm scared! I don't want to know!" Finally, she came downstairs ready to face the inevitable. I said I'd drive her up to the school but before we went I gave her an envelope from UCAS - the university admissions service. We both thought it would just be some more official bumf to put in the recycling bin. She read it sitting at the bottom of our stairs and then she realised. It was not a general UCAS mailing after all. It was saying something very special, something she had been hoping for and waiting for all summer long. I can't remember the precise words but it was along these lines -"congratulations... successful... required grades... University of Birmingham". Her eyes filled up. "I've done it Dad! I'm going to Birmingham!" We set off to her school in full and confident knowledge that she had made her required grades. She went in to pick up her exam documents and emerged moments later to tell me how well she had done - A in English, A in Theatre Studies, A for the General Paper and B for Sociology - missing out on a fourth A grade by just five marks. Fanbloodytastic! I don't mind saying I wept a few tears myself. Funny that, isn't it? How sometimes positive delight can grab you so much that you weep tears of joy. Frances (Right) with her friend Meg before the Sixth Form Prom in July. We are all so proud of her. She will be taking a four year degree course in American and Canadian Studies with a year studying at a North American university. Do they have any universities in Seattle or maybe North Carolina? Watch out! The Yorkshire Pudding empire is spreading! Last night I undertook the pub quiz at the local with three of the four most important women in my life - my wife, my daughter and my niece Katie who was on a flying visit from western Ireland. Suffice it to say, we didn't win. Today I drove Katie over to Beverley where the fourth member of the quartet resides - my mother Doreen - born in 1921. She has been in a residential home there for two years now but she is really starting to fade away. Once a robust and hyperactive lover of life, she is now skin and bone, drifting in and out of her slumbers, lying in her bed, unable to walk, barely able to raise her baby beaker to her mouth, showing only a very dull interest in the various items of news we brought from the outer world. And the best news of all was that Katie is pregnant at the age of thirty. Hurrah! It will mean so much to her and Seamus and to her parents Gloria and my brother Paul who was sixty last week. The shared secret of a new life coming should have filled my mum's eyes with delight but instead there was dull, spaced out emptiness. I can already see that the new baby will never meet its great grandmother. The baton of life will be exchanged. Mum in December 2005 at the residential home. As I descended the stairs, my heart was heavy. Outside a thin rain continued to fall. That was my mum that was - at least it was the vessel in which the real mum used to live - the mum who stayed up till the early hours knitting and sewing and weaving baskets, fashioning leather gloves and lampshades, the mum who could run like the wind and sing like an opera star, the mum who ironed huge piles of clothes and made rice puddings with a nutmeg skin, the mum who read me stories on her knee and yelled at us when we'd been bad, the mum who taught me to read and write when I was three years old and the mum who blushed with embarrassment when I made my first innocent enquiries about the processes of human reproduction, the mum who learnt German at night school and led the WAAF band in Delhi during World War Two. I can feel it in my bones, she's going just as Katie's unborn foetus is reaching for life. Above: The beach at beautiful Biarritz. Below: Aliens collecting holy water in holy plastic bottles from the holy taps at Lourdes. Below: High on an Ariege hill - my brother Robin's farmhouse and gites. Above: Pyrenneen horses roaming above 2000 metres. Below: The changing face of the ever present mountains. Below: The Mediterranean just above Cerbere and three miles from the border with Spain.